Fire and smoke damage to your home can create a lot of problems. From fireplace issues with smoke backing up into the house, to people placing their grills or smokers too close to the exterior siding: at this time of year it is not an uncommon occurrence in Kansas City. Many of us want to take advantage of the unseasonably milder temperatures outdoors and break out the grill. Or during a cold winter night, nothing is nicer than a warm fire in the fireplace. Unfortunately, with either situation, we sometimes get sidetracked and don’t keep a close watch and the fire gets out of control. The result can be a devastating fire or heavy smoke rolling inside leaving a coat of sticky residue and ash all over the house. No homeowner wants to experience this! TIP: One way to avoid fire and smoke damage is to have the flue cleaned every year to prevent flue fires. 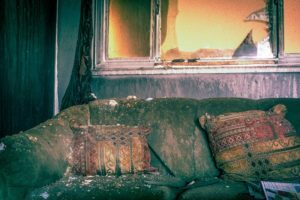 Homeowners should know exactly how and where fire and smoke damage can impact the home before the cleanup process begins, especially since some areas of the home may have smoke damage that isn’t readily apparent. Fortunately, professional smoke damage cleanup services are available from AAS Restoration. Whether the smoke damage is from kitchen flare-ups, closed fireplace flues or electrical fires – smoke damage discolors the walls and permeates everything, leaving a foul odor that is hard to get rid of. The longer the odors linger the more they soak into walls, carpets and furniture. Plastic surfaces, appliances and wood can also become discolored and warped. Countertops, tiles and other porous surfaces such as marble, granite or travertine can become permanently discolored from the acidic residue found in soot, which can also permanently tarnish metal fixtures and hardware. Getting rid of the smoke residue or soot as soon as possible is the first step to reducing the unpleasant odor of a fire. Smoke particles, which are partially or completely burned substances that are sometimes toxic and can penetrate surfaces and fabrics, can get trapped in clothing, carpeting, draperies and upholstered furniture. Unless these items are properly cleaned and deodorized by a professional smoke damage cleanup service, they may retain the smoky smell for a long period of time. Here are two immediate steps you should take as soon as it is safe to enter the home. Once it’s safe to enter your home you need to ventilate the house as quickly as possible. This will minimize smoke damage and allow for easier cleanup. Open windows and doors, turn off the HVAC system so it won’t spread the smoake and set fans out to help mitigate the odor. Remove any heavily smoke damaged items. The house will have to be deep-cleaned from top to bottom. The professional smoke damage restoration team at AAS Restoration can take care of all the cleanup quickly and expertly. Smoke damage can also impact a home’s structure, wall studs, insulation and air ducts in the HVAC system. When this happens the smoke odor can reoccur periodically and even cause respiratory problems. The level of fire and smoke damage to the home varies depending on where it originated. Enclosed spaces typically will not have as much smoke damage as a large, open room. After experiencing smoke damage, as soon as possible, homeowners need to contact a professional cleanup service to assess the smoke damage and advise you on what restoration and repair services are needed. The sooner the better as the longer it is left unattended the worse the problem can become. Give us a call – we are ready to help you put your world back together. AAS Restoration (816) 861-1550 Kansas City. Or contact us via our website. Cooking fires are most often caused by unattended cooking. Make it a rule –if you leave the kitchen, turn off your stove. If that isn’t feasible, carry a cooking utensil with you when you leave the kitchen so you remember you have something cooking on the stove. Basehor, Belton, Blue Springs, Bonner Springs, Buckner, Claycomo, De Soto, Edgerton, Edwardsville, Excelsior Springs, Fairway, Garden City, Gardner, Gladstone, Grain Valley, Grandview, Greenwood, Harrisonville, Higginsville, Independence, Kansas City, Kearney, Lake Lotawana, Lake of the Ozarks, Lake Winnebago, Lansing, Lawrence, Lawson, Leavenworth, Leawood, Lee's Summit, Lenexa, Lexington, Liberty, Lone Jack, Louisburg, Merriam, Mission, Mission Hills, North Kansas City, Oak Grove, Odessa, Olathe, Osawatomie, Ottawa, Overland Park, Paola, Parkville, Peculiar, Platte City, Plattsburg, Pleasant Hill, Pleasant Valley, Prairie Village, Raymore, Raytown, Richmond, Riverside, Roeland Park, Saint Joseph, Shawnee, Smithville, Spring Hill, Sugar Creek, Tonganoxie, Topeka, Warrensburg, Weatherby Lake, Wellsville, Westwood, and other areas.